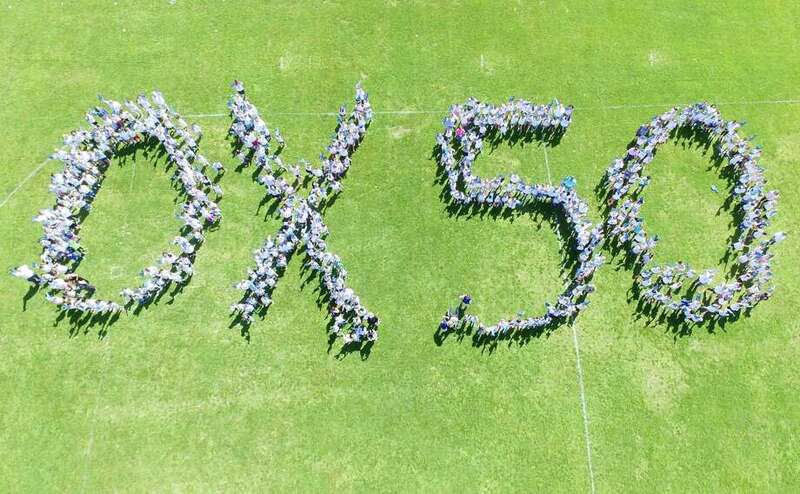 Wearing white shirts and carrying blue signs, Ox Ridge Elementary School celebrates turning 50. DARIEN — The town will construct a new Ox Ridge Elementary School at an estimated price tag of $50 million. Faced with the option renovating, building a new wing or building anew the school board chose the most expensive of the options. The decision is to build a new school that would also centralize the district’s Early Learning Program (ELP). The Board of Education passed education specifications for the new building on Sept. 12. This would outline key components that have to be included in the new school. Landon said all ELP classrooms will measure 1,000 square feet plus an additional 60 square feet to accommodate a lavatory in each classroom. In addition to this, two of the ELP classrooms will have 26 cubbies each in the event they need to be converted into kindergarten or first-grade classrooms. “We’ve elected to add the possibility of a common room to the Early Learning Program,” said Landon. The decision to make the school, originally built in 1966, bigger and remove portable classrooms is estimated to cost the district $50 million. There will also be an outdoor specialized program for the ELP students, he said. ELP and Kindergarten classrooms will be placed on the first floor. All of the first to fifth-grade classrooms will be able to accommodate 26 students. At it’s peak Ox Ridge will serve a population of 461 students excluding the ELP students. Board of Education chairman Tara Ochman said the education specifications are what must be included within the building. However, the overall design of the building will be up to the building committee put together by the Board of Selectmen. “The idea was that the ELP has grown from what it originally was and it’s now dispersed between two buildings, with some classes being held in a third building,” she said. Ochman said since Ox Ridge Elementary school was due to be rebuilt and because of the size of the property, it was considered the best option for the centralized ELP program. “Moving the ELP into Ox Ridge will free up classrooms at other schools,” she said. The decision could also be budgetary friendly. With the construction of a new building and a consolidated ELP program there could be fewer administrators, she said. The board will present these specifications and requests to the Board of Selectmen on Monday.